NOTE: 3M Peltor PTT cables and adapters are built to order by the manufacturer and vary in price from $125 to $400 each. We will be happy to assist you in determining the exact PTT cable or adapter you need to work with your radios as well as providing a quote with our best estimate of the time to delivery: or call us during business hours: 1-918-478-5500. 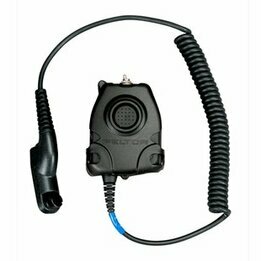 3M Peltor ComTac, SwatTac, MT Series and other model two-way radio headsets are generally equipped with a fixed downlead (or two), terminated with a male TP-120 plug that mates with a push-to-talk (PTT) inline adapter cable. Each PTT cable is terminated on the other end with the connector required to plug into one of the many different two-way radios currently on the market. The list of adapters shown below, along with the radio models they fit, is rather extensive. Please feel free to contact us if you have questions about these products. . We will be happy to supply or confirm the correct PTT adapter for your specific radio. Recognizing that two way radio headsets are built to two different wiring standards which we refer to as Standard Wired or NATO Wired, most of the PTT adapter cables are available with the same connectors, but wired either Standard or NATO. As a helpful clue, manufacturer's part numbers ending in "-02", "-01", or "-01N" are almost always NATO Wired, while numbers without a suffix are generally Standard Wired. We understand that product selection in this category can be confusing. Please also note that we can provide the full range of adapter cables and ComTac accessories. If you do not find the part number you need or you are not sure, just let us know and we will get exactly what you need. Please contact us and we will be happy to help: . NOTE: FL5010-01N includes an input for a remote wired PTT.